Definition at line 41 of file llmetrics.cpp. Definition at line 44 of file llmetrics.cpp. Definition at line 58 of file llmetrics.cpp. 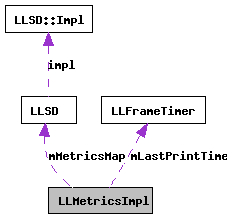 Definition at line 100 of file llmetrics.cpp. References LLSD::append(), LLSD::beginMap(), LLSD::emptyArray(), LLSD::emptyMap(), LLSD::endMap(), LLFrameTimer::getElapsedTimeAndResetF32(), llendl, llinfos, mLastPrintTimer, and mMetricsMap. Definition at line 80 of file llmetrics.cpp. Referenced by LLMetrics::recordEvent(), and recordEventDetails(). Definition at line 62 of file llmetrics.cpp. References LLSD::emptyMap(), llendl, llinfos, and recordEvent(). Definition at line 54 of file llmetrics.cpp. Definition at line 55 of file llmetrics.cpp. Referenced by printTotals(), and recordEvent().